Foundr podcast started as a digital magazine (based on iOS & Android) for young entrepreneurs by young entrepreneurs hosted by Nathan Chan. While still in his mid-twenties, Nathan Chan felt there were no business magazines that he could relate to. He wanted to read something that delved deep into the world of a successful entrepreneur, showing their processes, failures, obstacles and challenges; and one that ultimately taught others straight from the mouths of the best in the world. Wanting to personally discover the answers to all his questions about the daily struggles of starting a successful business, Nathan began to go out and interview world-changing entrepreneurs in the hope that he could learn from them. This was the point of no return. And so, while still working a full-time job, Nathan created Foundr. Since its inception, Foundr has quickly become a top ten ranked ‘Business & Investing’ Magazine in the AppStore and is currently supporting hundreds of thousands of entrepreneurs across multiple platforms and resources. 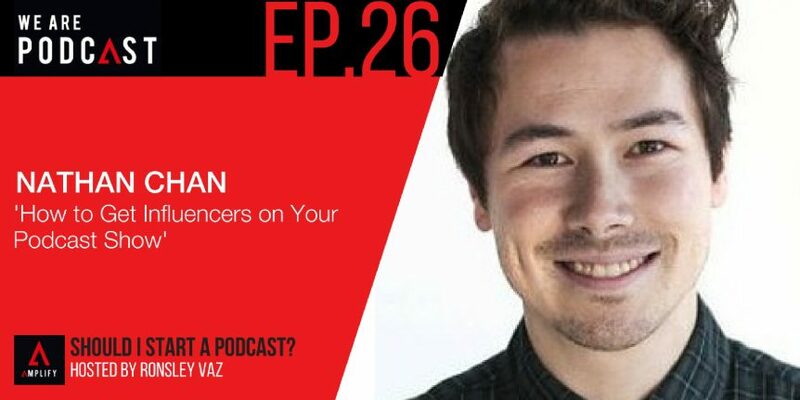 How and when Nathan Chan started Foundr Mag Podcast? The influence of magazine as leverage in order to get in touch with entrepreneurs. Running a multifaceted digital media magazine through a podcast. The need to create the magazine. The differences of Foundr Mag with other publications and what makes it unique. The features of Foundr magazine. Creating a little bit of something different in the space. The difference in having a podcast and how it benefits Nathan. The importance of giving your best and progressing in a podcast. How does podcast work alongside his business? How podcast builds community and trust? The thousands of podcast downloads that Foundr Mag gets everyday. Getting trust and building an audience through a podcast. Being persistent and inviting hard-to-reach people to his podcast. The strategies employed through Instagram to attract audiences. Creating epic content that people want to share and follow. Building communities anywhere and doing something with them. How they rapidly grow to build communities? Partnership as the key in any business development. You've got to learn how to create epic content that people want to share and follow. If you can build a community anywhere, then you can do something with it. But I guess it comes back to the fact that everyone wants to know how we rapidly grow it. I can see that they talk about it all day. In fact, we created a course: a step by step course and, in my opinion, it's the ultimate way to really screw yourself up. You can find that course at http://www.igdomination.com. I recommend that people go and check out the free ebook. It’s a great place to start. Also, go to http://www.foundrmag.com/free. I think the biggest thing is firstly creating epic content, whatever niche you’re in; it has to be brilliantly designed and you have to post, I guess. The next thing is posting consistently. The more you post, the faster you grow. We post four to six times a day. And then the next big thing is using hashtags. Hashtags can be a massive game changer when it comes to growth. The last thing would be S for S (Share for Share; Shut out for Shutout). It's about getting other accounts to shut you out. I think if you want your content to spread then create something useful – create something that's the best and then the content will do the work for you.